Father Ron Josephs was born to a Millers Point family in 1932. His parents were from a mixture of Portuguese, Irish and Norwegian stock. In his interview he talks about his childhood, sport, playgrounds and schooling; choosing the priesthood in adult life; demolished buildings; the extent of Catholicism in the area; neighbours and friends; Christmas; and family support. In the excerpt below he recalls significant priests in the local parish, St Patrick’s. Father Hurley, he’d been there since about 1928 and he was in his nineties when he eventually died. He was always a great man, a great preacher. Then Father Roach, a man who worked for years in the Pacific Islands in the missionary field but also at St Patrick’s. Father Harry Smith, who was a chaplain during the war in our Army and was captured by the Japanese and spent a long time in Changi. 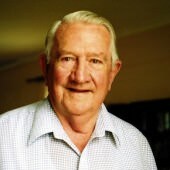 Father Lionel Marsden, who had only been ordained at the end of 1940 – he went into the Australian Army too and was a prisoner-of-war in Changi for years. Then Father Lenny Bourne, Father Wally Fingleton, a brother of Jack Fingleton the test cricketer; Father John Smith, Father Tom le Strange. They were the main ones during my time of growing up there at St Patrick’s.